Paris, France, 2012/11/21: Blue Cat Audio ( http://www.bluecataudio.com ) is pleased to announce that Zynaptiq GmbH (Hannover, Germany) is licensing Blue Cat Audio's "Kitty" audio plug-ins development kit to port their UNVEIL plug-in to multiple platforms. Zynaptiq's recently announced UNVEIL 1.5 update is a major rework of their unique realtime de-reverberation and signal focusing plug-in. 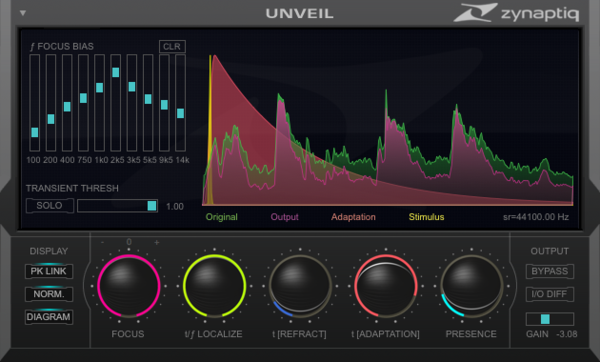 Based on artificial intelligence powered de-mixing, UNVEIL allows the user to attenuate or boost the amount of reverb contained in a mixed recording, and bringing out or suppressing inherent detail. Thanks to Blue Cat Audio's technology, it is now available on both Mac and PC, in VST, Audio Unit, AAX and RTAS formats and includes multiple new features and enhancements. "When we were evaluating our options for bringing UNVEIL to more formats and platforms, we were determined to settle for nothing but the very best solution." said Denis H. Goekdag, CEO of Zynaptiq. "Well, we have found exactly that at Blue Cat Audio. Their Kitty SDK is highly functional as well as rock-solid, and their development team combines profound know-how with high efficiency and reliability - a perfect match for our state-of-the-art technology." "Zynaptiq is one of the most innovative audio companies out there," says Guillaume Jeulin, founder and CEO of Blue Cat Audio. "It was natural for us to work together: our software development framework complements Zynaptiq's unique algorithms. It gave them the opportunity to port their Mac-only Audio Unit plug-in to all major plug-in formats, on both Mac and Windows systems, in record time. We are proud to be part of Zynaptiq's effort to make their incredible plug-in available on most Digital Audio Workstations (DAW)." Blue Cat Audio develops audio software for musicians and audio professionals. The French company is known for its own high-end audio effects and innovative analysis tools available as software plug-ins. But it also targets third party tech companies with its technology licensing program and its complementary software engineering and consulting services. Zynaptiq GmbH, based in Hannover, Germany, creates audio software based on artificial intelligence technology, and is also known for their real-time polyphonic pitch-mapping plug-in PITCHMAP.